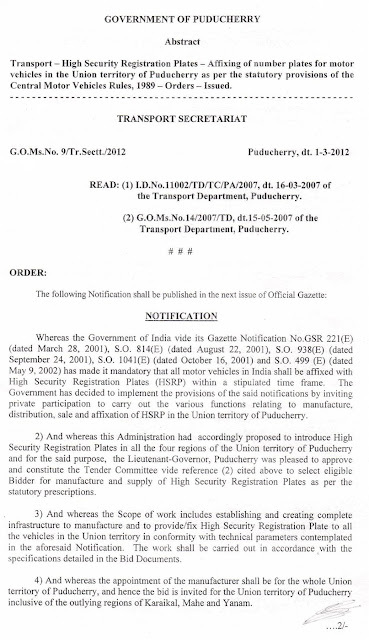 PUDUCHERRY: The process for fixing High Security Registration Plates (HSRP) on vehicles plying in the UT will begin on Monday. 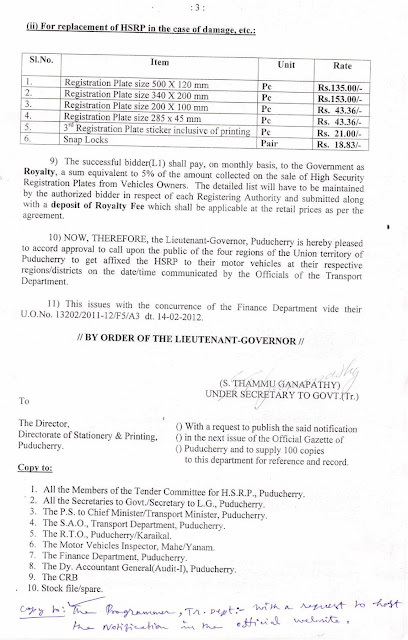 According to transport commissioner T Karikalan, HSRPs would be fixed on a few vehicles at a function to be held here between 3 pm and 4 pm in the presence of Chief Minister N Rangasamy, thereby kick-starting the process. Vehicle owners will have to cover the cost of fixing the tamper- proof number plates. The cost of the HSRPs, starting from `50 per plate, would depend on the size. 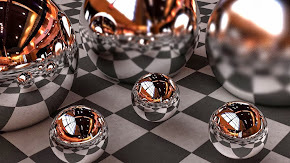 The HSRPs would have a Unique Identity number, the registration number, chassis number, details of the owners and a hologram. 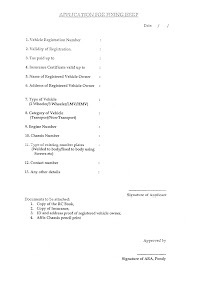 The new number plates can only be fixed on the premises of the Transport Department. 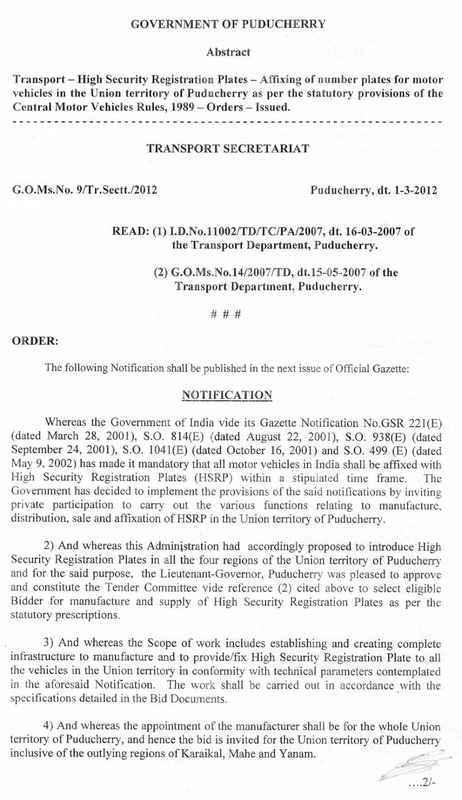 Hyderabad-based PROMUK Hoffmann International has entered into a contract with the UT administration to fix the HSRPs. The process of fixing the tamper-proof HSRPs is expected to take 15 minutes per vehicle. The Supreme Court had earlier ordered that the entire process in the UT be completed by June. The transport department has set in motion the process of fixing High Security Registration Plates (HSRP) in all motor vehicles in the Union Territory. From April 1, all vehicles registered with the transport department will have HSRP. 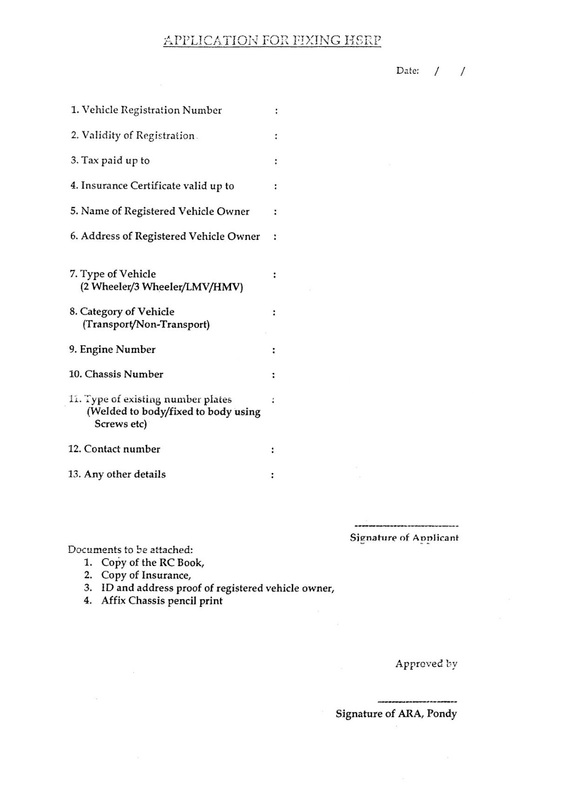 The decision is in compliance with a Supreme Court order mandating all states to fully implement the scheme by April 30 for new vehicles and by June 15 for old vehicles. 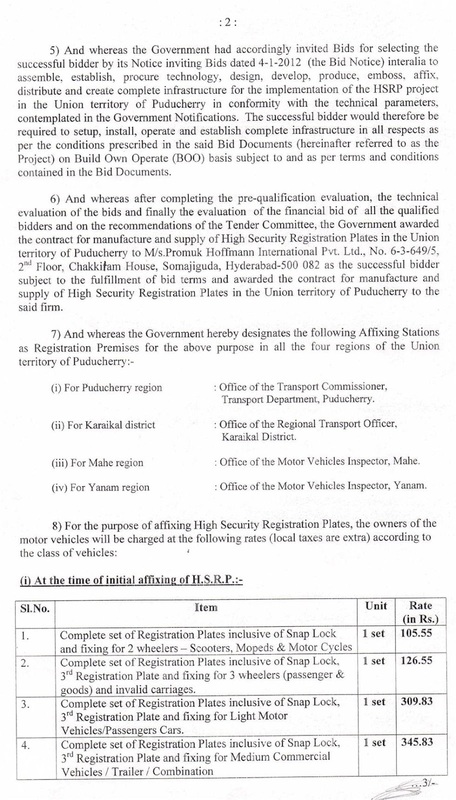 “We will be filing an affidavit in the apex court on March 26 on the private firm that has been entrusted with the job of making high security registration plates here. Promuck Hoffmann of Hyderabad was selected through a bidding process and the transport department has already allocated space within the RTO to enable the firm to set up the required infrastructure and manufacturing facilities to kick-start the process”, transport commissioner T. Karikalan told DC. He said that the high security registration plates would be specially designed in chromium and aluminum and available in all regional transport offices in the Union Territory. The number plates will carry unique identification numbers, holograms and digital stickers with hot stamping which will give complete information about the vehicle. The plates will be attached with snap locks which cannot be opened or removed by anyone else. It can only be broken and has to be fixed again at the RTOs, he said. 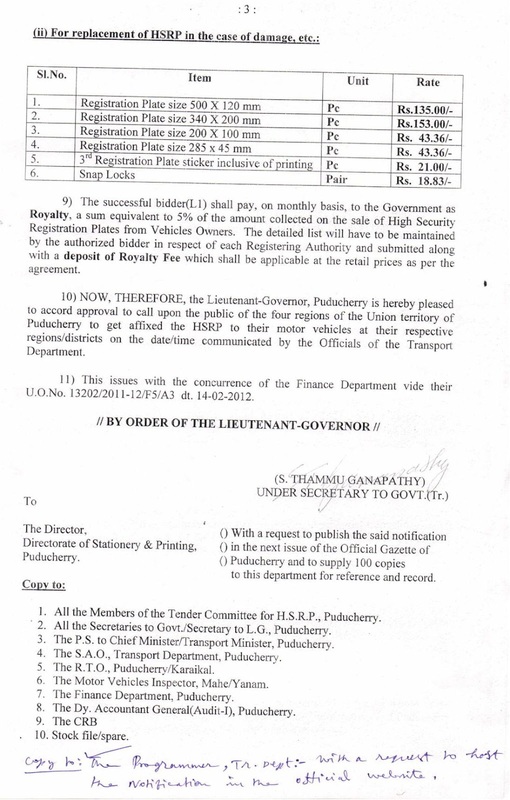 Also download the below mentioned "Application for Fixing HSRP" and to fill-up the same and to submit the same before the RTO Office, Pondicherry alongwith the FOUR enclosures as detailed in the Footnote of this Application. This is useful blog, contains rich content about Create a Number Plate.All kinds of show plates and numberplates is excelled, we make sure the work according to your demand and choice and timely delivery is ensured.